10 a.m., 11 a.m., 12 p.m.
Thursday - Sunday 10 a.m., 11 a.m. and 12 p.m.
Get aboard a specially outfitted, open-air vehicle for an exclusive tour of the 40-acre Watani Grasslands! An experienced zoo educator will introduce you to nine species—nearly 100 animals! Discover rhinoceroses, gazelles, greater kudus, ostriches and many exotic antelope. Guests may even get a special view of the elephants! 10:00 a.m. Tour - Ticket sales end at 9:30 a.m. Ticketed guests must board the Zoofari shuttle bus in Junction Plaza by 9:45 a.m.
11:00 a.m. Tour - Ticket sales end at 10:30 a.m. Ticketed guests must board the Zoofari shuttle bus in Junction Plaza by 10:45 a.m.
12:00 noon Tour - Ticket sales end at 11:30 a.m. Ticketed guests must board the Zoofari shuttle bus in Junction Plaza by 11:45 a.m. The ride may be bumpy, as the vehicle crosses uneven terrain and may need to stop suddenly. Guests should be in good health and free from high blood pressure, heart, back or neck problems, claustrophobia or other conditions that could be aggravated by this wildlife adventure. Children participating must be supervised at all times. Minors age 12 years and under must be accompanied by a paying adult. At this time, Zoofari is not wheelchair accessible. Due to the nature of the experience, service animals are not permitted on this attraction. 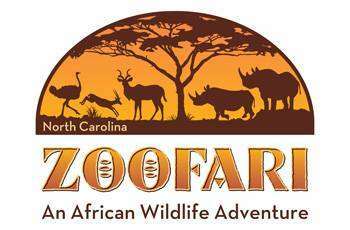 Select from many unique behind-the-scenes tours of our animal habitats with the North Carolina Zoo Society!